Peggy has several nice wins to her credit. She earned a Group I in puppy competition to start with. August 2005 ~ she was reserve to her sister Whisper at the Rocky Mountain Beagle Club Specialty. with her sister taking Reserve. 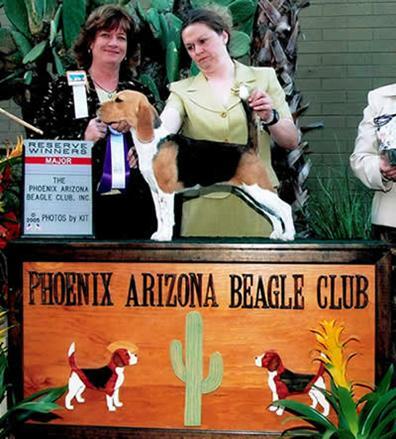 September 2005 ~ she was again reserve to her sister at the Phoenix Arizona Beagle Specialty prior to the Nationals. She easily finished with a major in Feb 2006. Peggy was loved and owned by Teresa Gaier.